In coastal dunes, landscape changes are a rule, rather than an exception. This paper gives an overview of changes in landscape and vegetation with a focus on the past century. The history of dunes is characterised by phases of sand drift, alternated with geomorphological stability. The historical development of dune woodland during these stable phases has been documented for sites all over Europe. Vegetation reconstructions of historical open dune habitats however is very difficult due to limited preservation of fossil remains. 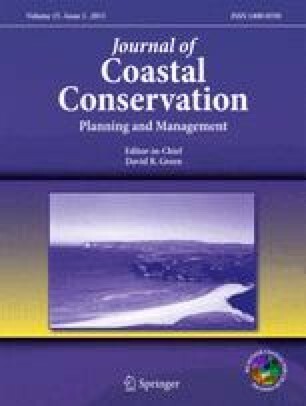 People have drastically altered coastal dune landscapes through centuries of exploitation and more recently development of the coast. Historical land use has generally pushed vegetation back into a semi-natural state. During roughly the past century a tendency of increasing fixation and succession is observed on coastal dunes throughout northwest Europe. Six causes of change are discussed. 1) Changes in land use, mainly abandonment of agricultural practices, have led to the development of late successional stages such as scrub and woodland. 2) Crashing rabbit populations due to myxomatosis in the 1950s caused vigorous grass growth and probably stimulated scrub development. 3) A general tendency of landscape fixation is observed due to both natural and anthropogenic factors. 4) Eutrophication, mainly due to atmospheric nitrogen deposition is clearly linked to grass encroachment on acidic but also on some calcareous dunes. 5) The impact of climate change on vegetation is still unclear but probably lengthening of growing season and maybe enhanced CO2 concentrations have led to an acceleration of succession. 6) A general anthropogenisation of the landscape occurs with rapid spread of non-native species as an important consequence. The reconstruction of a natural reference landscape is considered largely unattainable because of irreversible changes and the long tradition of human impact, in many cases since the development of the dunes. Two contradictory elements need reconciliation. First, the general acceleration of succession and scrub and woodland development in particular is partly caused by a decreased anthropogenic interference in the landscape and deserves more appreciation. Second, most biodiversity values are largely linked to open, early succession dune habitats and are threatened by the same tendency. Apart from internal nature management, in which grazing plays an important part, re-mobilisation of stable, senescent dunes is an important challenge for dune management.